LG has revealed the reason it is to bring both active and passive 3D technology to homes in the UK – and it's all down to consumers asking for the technology. 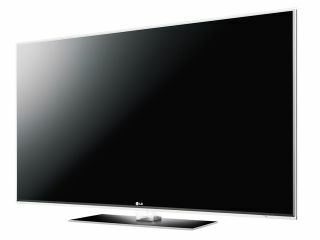 Speaking at the launch of the Freeview HD platform, where LG showed off its LE7900 range with the platform built-in, we quizzed the company on conflicting reports that its passive 3D TV range would be only in pubs. A spokesperson confirmed that its passive 3D TVs – the LD360 range – will indeed be available to consumers, as well as its active-shutter LX990 3D TV range. "We had great success trialling the passive TVs in pubs in collaboration with Sky and this is set to continue in April, starting with the Manchester Utd Vs Chelsea match this weekend. "Although the LD920 range was primarily to be used by Sky to showcase its 3D football, we had been getting letters about the passive tech from consumers, asking when it will launch in the home. "This is why we will be launching the 47-inch LD360 in the home, starting from the end of May." When asked if consumers would get confused with two 3D technologies, the spokesperson added: "It's all about choice. The active glasses aren't cheap at about £80 a pair, while the TVs themselves are well-priced. "When it comes to passive 3D, the glasses can be sold for as little as £1 while the screens are more expensive, due to the polarisation of the screen. "You may find couples but the more expensive active glasses and screen while those with bigger families may opt for the cheaper glasses option." It was also revealed that for the first upcoming public 3D match, LG will be displaying both active and passive 3D in selected pubs to give viewers the choice to sample both technologies. Don't expect to see the active-shutter glasses used in pubs any time soon, though, as the price of technology and alcohol just don't mix.